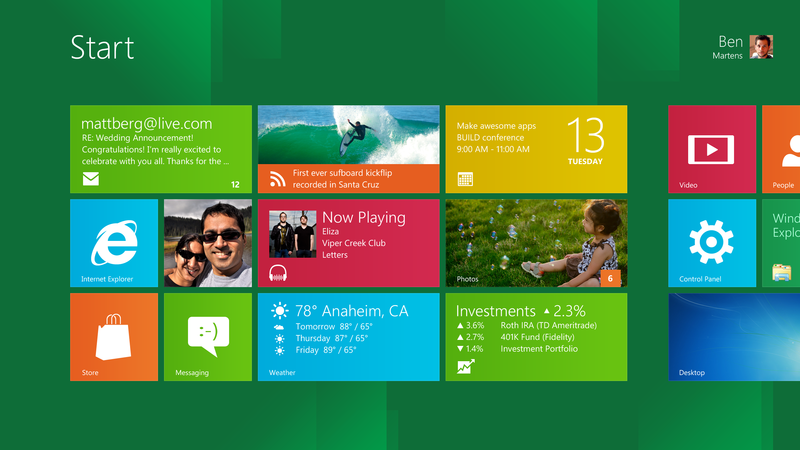 The Windows 8 Start screen (click to enlarge). Windows 8 is a bold new take on computing, unifying tablets, desktops, laptops, the Internet, and smartphones under one Windows roof. With only a brief introduction to the operating system here at Microsoft's BUILD conference, we are seeing Microsoft skillfully bridge today's computing habits into the future--otherwise known to Microsoft as Windows 8. Microsoft’s concept for Windows 8 is simple: Take a look at the technological trends driving the industry forward, and develop an operating system to address it. Microsoft has gone to some lengths to create a platform that's tablet-friendly, while dragging old-school computers into the future. This approach appears to solve the problem we all have: If you use more than one kind of device, your tech ecosystem is something of a mess. Don’t believe me? Take a look at the iPhone or iPad, and the Macbook. The devices are designed with completely different goals in mind: The phone and tablet are used for content consumption and the laptop and desktop for content creation. We can argue the finer points--I get plenty of writing done on my iPad, for example--but iOS and OSX remain estranged, albeit cordial relatives. Ditto for Google: The Ice Cream Sandwich version of the Android OS should potentially resolve differences between Android tablets and smartphones, but consider the Chrome browser (and Chrome notebooks), which offer no interoperability. That is par for the course, and (some would argue) just as it should be--using the right tool for the job and all that. But while Apple and Google scramble to further compartmentalize tech, Microsoft has gone and built the Everywhere OS. How Does Windows 8 Accomplish This? Everything revolves around your Windows Live account. Enter your log-in information onto new devices, and your personalized Start screen layout moves with you, keeping track of the particular image you’ve chosen for your lock screen, or the particulars of your tile layout. And here's how it gets very useful. Stuck at the office, but need some files that are on your home PC? Fire up Skydrive, a file-hosting service that allows users to upload files to cloud storage, and you’ll have access to everything that's on the home machine--from the PowerPoint presentation on your desktop to the PDFs on the disc you left in the DVD drive. Connect your Flickr and Facebook accounts to your Windows Live account, and they'll automatically populate onto any Windows 8 device. The key point here is the phrase "Windows 8 device." That means the beefy gaming rig that sits under your desk, as well as your laptop and your Windows 8 tablet. The same content, with the same interface (scaling permitting), will be displayed across all of the devices you own. Imagine if your work and home PCs shared content and data readily. Now imagine that the tablet you carry with you on your commute bridges that gap--working and playing anywhere, with (ideally) seamless interruptions wherever you roamed. Sounds great, right? Windows 8’s new Metro apps are a missing variable: It stands to reason that if your desktop layout is replicated on your tablet, the apps you’ve downloaded will make the jump, too. But without some more time to see the interplay between multiple devices in action, we can’t tell you how well that works. Microsoft has gone to great lengths to ensure that creating Metro apps is a painless process. 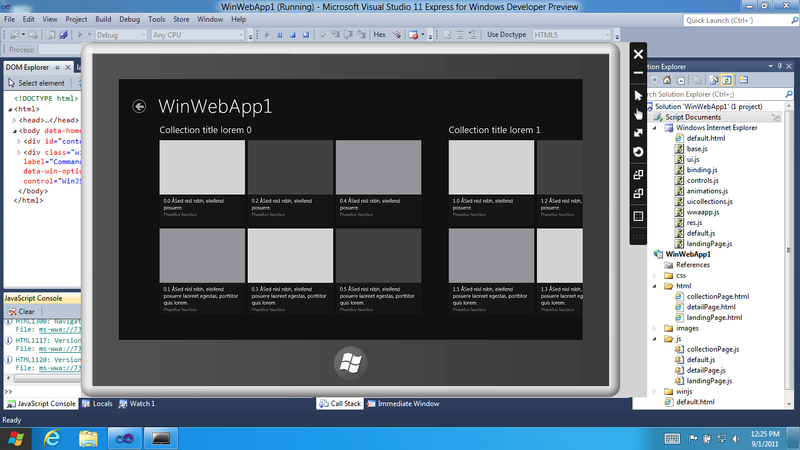 The upcoming version of Microsoft’s Visual Studio development platform will all but write your Metro apps for you, offering templates that fit the visual theme while integrating with Windows 8’s technical capabilities. Writing new Metro-friendly applications is also simplified. For instance, tossing in a few lines of code will turn a simple scrollbar into one that supports the full breadth of Windows 8’s multitouch capabilities. The end goal is obviously to get as many developers on the platform as possible, and thus circumvent the old "Apple has so many apps!" chestnut. But with this notable difference: A developer need only pour resources into a single platform (a single programming language, really) to reach an audience that spans all manner of devices. For instance, I could write an HTML 5-based sticky-note app for jotting down thoughts while I’m on my laptop. Then I could fire up my tablet, and use my new app on it with a stylus--taking advantage of Windows 8’s built-in handwriting recognition--with no extra effort on my part. We’ll be getting a better taste of the platform over the next few days. Stay tuned.